Research surrounding flavonoids, the healthy chemicals found in myriad fruits and vegetables as well as tea and wine, points to numerous health benefits for various patient populations—and the elder set is no exception. How flavonoids relate to bone health, cancer prevention, and especially cardiovascular disease protection have all been the focus of recent research, which shows that eating the chemical compounds through increased fruit and vegetable consumption is by far the safest way for older adults to gain the most from them. Brill says the greatest amounts of flavonoids can be found in vegetables, but fruits contain copious amounts as well. “There are six major subclasses of flavonoids: flavonols, flavones, isoflavones, flavanones, flavan-3-ols, and anthocyanidins,” she explains. Although some of the ways in which flavonoids impart their suggested health benefits remain unknown, it has been determined that their benefits result from several different mechanisms, based on the type of flavonoid, according to Ryan T. Hurt, MD, PhD, of the Mayo Clinic in Rochester, Minnesota. Hurt led research looking at flavonoids’ antiobesity effects for the 2012 study “Geriatric Obesity: Evaluating the Evidence for the Use of Flavonoids to Promote Weight Loss,” published in the Journal of Nutrition in Gerontology and Geriatrics. “All flavonoid types have different mechanisms of action or the way they work,” he notes. Hurt says the high quantities of catechins in green tea, for example, have anti-inflammatory properties but also potential antioxidant properties as well. “It really depends on which flavonoid as far as the different biochemical effects they have,” he says. • Vascular disease: Flavonoids, especially the flavonols quercetin and kaempferol, play a powerful role in heart disease, according to Brill. “Flavonoids are extremely protective against heart and vascular diseases,” she says. A new Australian study of older women (older than 75), published in the British Journal of Nutrition, found both flavonol and flavan-3-ol intake to be associated with a significant decrease in the risk of atherosclerotic vascular disease. “After five years of follow-up of older women, the study found those with the highest flavonoid intake cut their risk of coronary artery disease by 73% compared to those with lowest intakes,” Brill says. “One of the biggest problems with vascular disease is hyperlipidemia or elevated cholesterol,” Hurt notes, adding that several studies have shown flavonoids can affect various aspects of elevated cholesterol. “Quercetin was shown to increase HDL concentrations and decrease triglyceride concentrations in a placebo-controlled trial. It also was shown to decrease systolic blood pressure as well vs. control,” he says. However, Hurt says not all evidence pointed toward these benefits, with other studies showing the opposite effect, “that HDL actually may be reduced [with flavonoid intake]. Whether or not this was because of the effect that quercetin had on weight is very debatable,” adding that because of the small trial size, drawing large conclusions for various patient populations is often difficult. Brill suggests older adults find ways to include all types of flavonoids in their diet on a regular basis “in an attempt to keep their blood total antioxidant capacity high throughout the day—the ideal strategy for treating and preventing cardiovascular disease,” she says. • Bone health: Hurt says several recent epidemiological studies have shown that flavonoids may “enhance bone formation and inhibit bone reabsorption through different cell-signaling pathways that may help with the bone cells called osteoblasts and osteoclast differentiation.” While he notes that this is likely due to the chemicals’ anti-inflammatory mechanisms, he says there is no clinical trial to date that specifically confirms this finding. • Cancer prevention: Research investigating flavonoids’ potential for preventing cancer—or at least reducing the risk of developing it—is still ongoing, but Hurt says there are some data in a recent issue of the Journal of Nutrition in Gerontology and Geriatrics suggesting that flavonoid consumption may be tied to cancer prevention. For the research of note, researchers looked at several studies that “showed that flavonoids may have a protective effect on a number of cancers, including oropharyngeal cancer, gastric cancer, possibly pancreatic cancer, as well as colorectal cancer,” Hurt says. • Weight loss: Hurt’s recent research into flavonoids’ potential for weight loss may show the greatest potential for older adults, as the incidence of geriatric obesity continues to increase with the aging of the baby boom generation. Yet according to the article, while flavonoids were shown to demonstrate modest antiobesity effects in both animal and human studies, Hurt says research to date is insufficient to recommend widespread use to the elder population at this time. “The efficacy and safety of flavonoid use for weight loss has not been demonstrated in older adults,” he says. How can older adults most easily and safely increase the flavonoid content of their diet? That recommendation is simple: increase produce consumption. In her book Prevent a Second Heart Attack, Brill details which fruits and vegetables offer the greatest amounts of certain flavonoids. For example, quercetin is a flavonol found in yellow onions and broccoli, while catechins and proanthocyanidins, types of flavan-3-ols, can be found in cocoa and green tea. Apigenin, commonly found in celery and parsley, is a kind of flavone, and hesperidin is a flavanone found in oranges. Anthocyanins such as cyanidin and malvidin are in grape skins, and the isoflavone genistein is found in soy. Brill says quercetin and kaempferol are the most abundant flavonols in the diet, with fruits such as blueberries, black currants, apples, dark grapes, and apricots providing the greatest amounts. Because of the potential for adverse effects, Hurt advises against patients deriving flavonoids from dietary supplements, but he says recommending that older adults look for these beneficial compounds in whole foods can do a world of good. “I think doctors should caution their patients about using supratherapeutic doses mainly contained through supplements because a lot of times you don’t know what else is contained in those supplements, but rather get flavonoids from natural sources of fruits and vegetables,” he says. 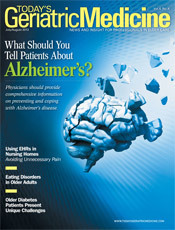 Overall, Hurt says physicians should be aware and pass along the information to their patients that a healthful diet that includes various fruits and vegetables containing antioxidants and flavonoids can be beneficial for patients’ overall health, including the potential for helping with maintaining a healthful weight.